If the last two weeks are any indication of what this school year will be like, then it will be a doozy. I need to get organized and get my stuff together, so I can enjoy this year and not be stressed by running behind. I also want to be present for my kids. We have a senior in high school this year with marching band and swim team, and one starting junior high with band. Then the baby of the family is in his last year of elementary. There’s a lot going on. We had to update shot records. 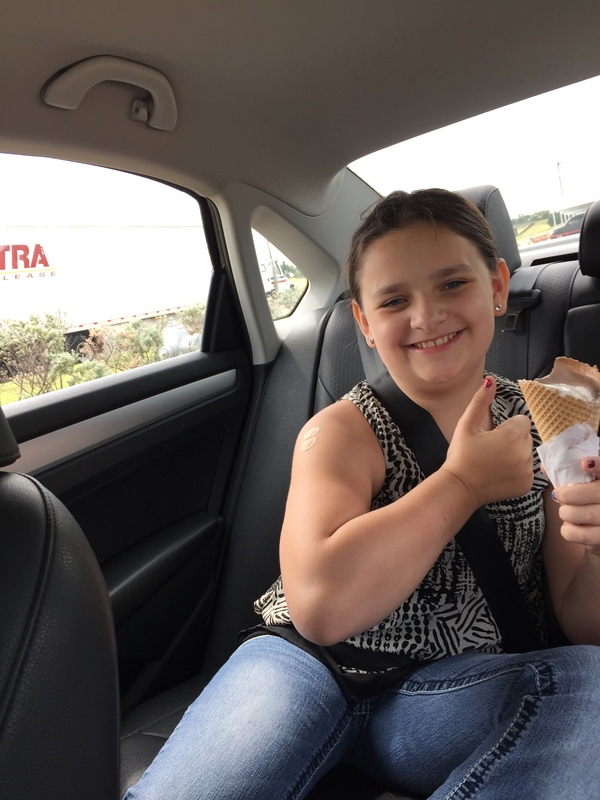 No tears this round, but she still got ice cream. 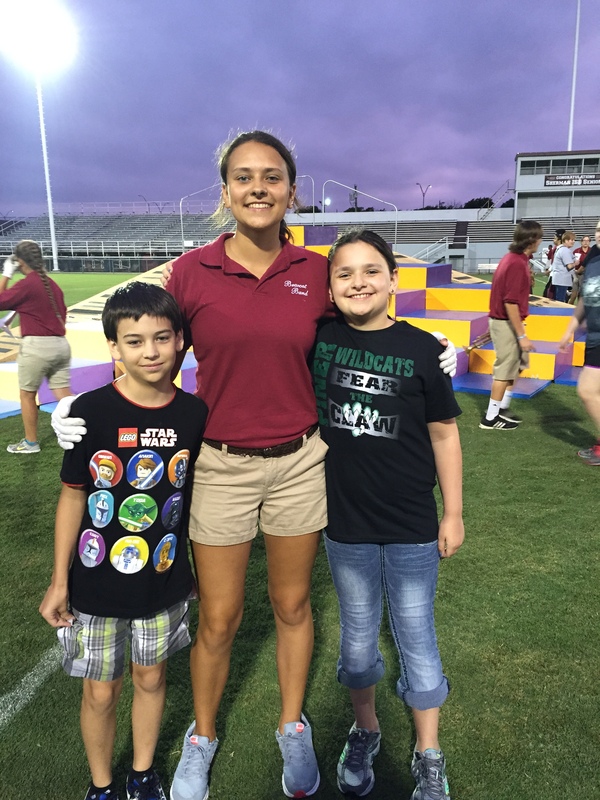 We went to a sneak peek band performance, and then they marched on the field with their big sister. We hosted a preteen retreat this past Friday for incoming seventh graders at our church, and a few youth helpers. I ate junk food. The key word here is “a” which would have been fine if that’s what I stayed with. 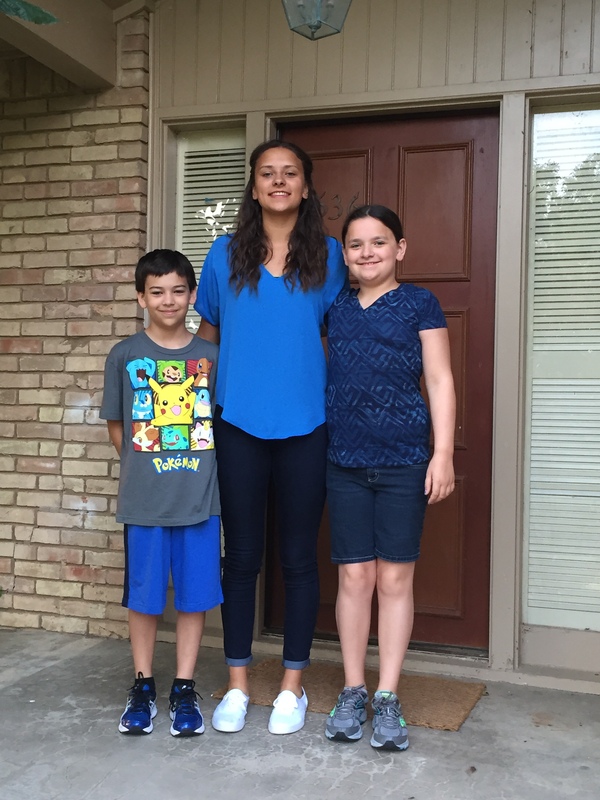 Then the first day of school came way too fast, and it coincided with the first day of marathon training. So here we go back to routines, schedules, and busy weeknights. Now, let me get back to running. Somewhere in the midst of all the “pregame” activities, I ran a local 10k. It’s one of the races I do every year. In fact, it was my first 5k – August 2010. It is in August, and it is hot, but I like supporting the United Way. This year, my running friend and I had started a 5k beginner group to finish the program with this race. 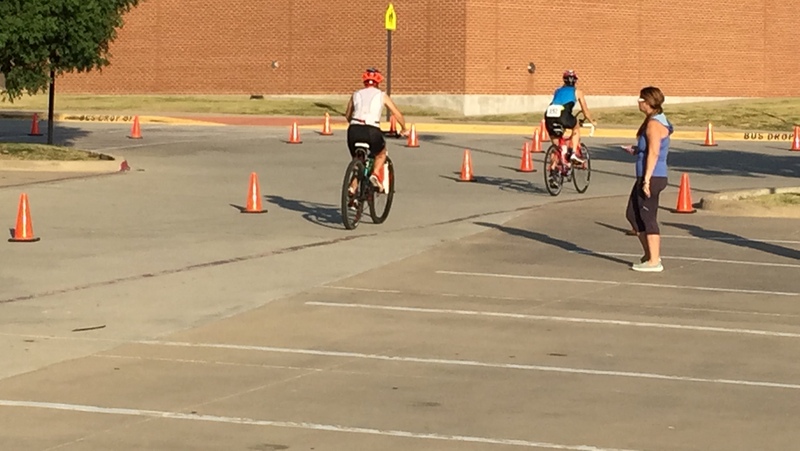 We had a few that stuck with it through the warm Saturday mornings, and I would have considered it a success even if we had just one person come. I created a Facebook group based off of this blog – Anyone Can Run, and used it to communicate workouts and other information. I struggled through the race around mile 4.5. It has been a while since I’ve ran that far – fast. Thanks to small races, I still placed first in my age group. 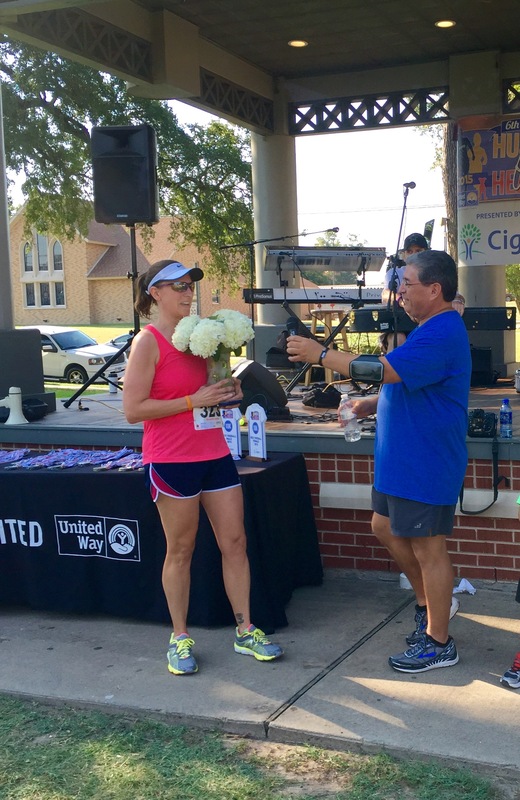 There was a surprise as the race director/President of the United Way chapter called me up to the stage to thank me for encouraging others with this race and coming to support it every year. Then he asked me to say a few words. My belief has always been that if you just stick with it, you won’t regret it. That’s what this blog is about – my parents who started running in their 60s, my friends who were late 40s and 50s, my brother who is just a bit younger than me. I was a few minutes off from my best course time two years ago, but I haven’t been running fast this year from my injury. 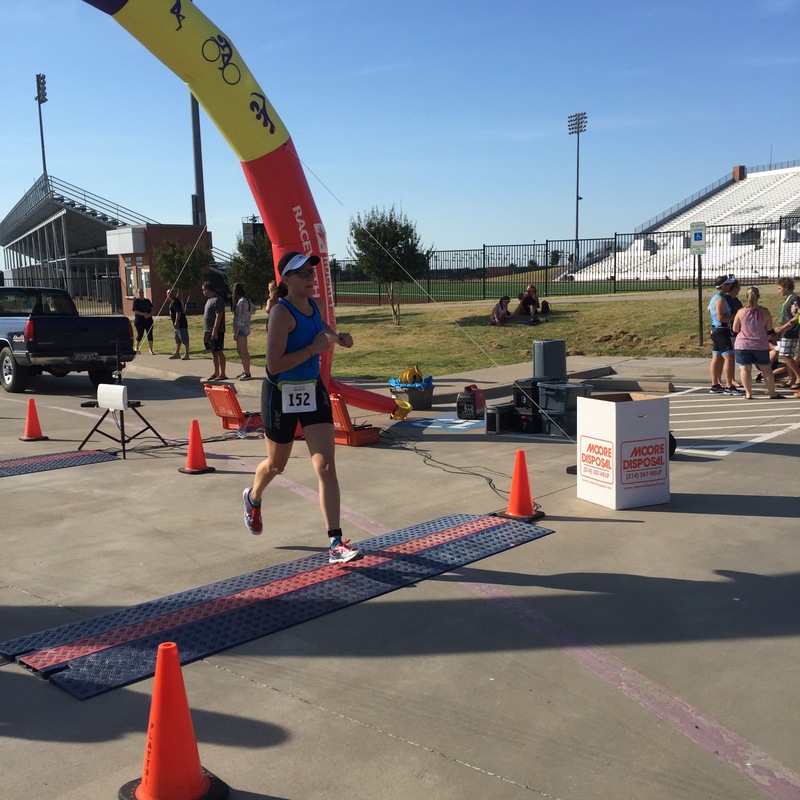 The race did help me come up with training goals and paces for my marathon in December. I have to remember to work from where I am, not where I was. I’m excited about the Dallas Marathon this year. 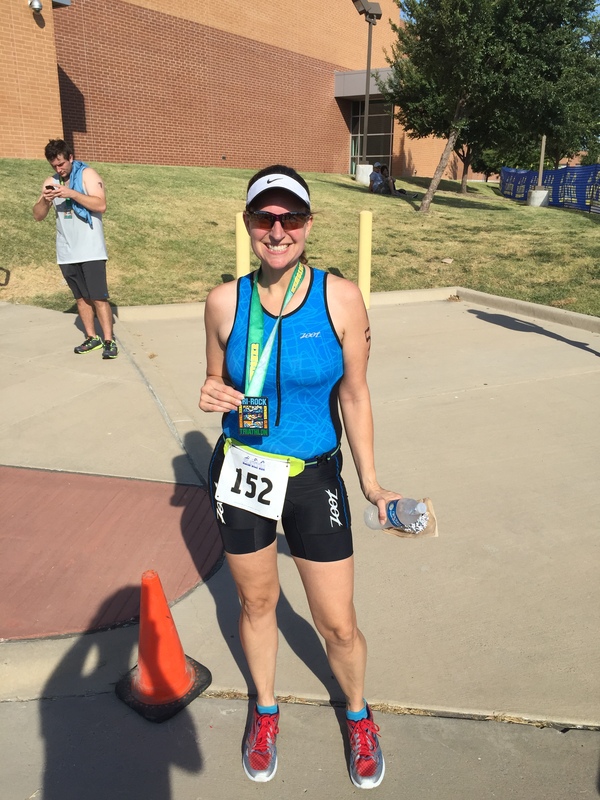 There are several from our running group who will be doing their first marathon in Dallas – including my best running friend. As soon as she registers. Wow, I don’t even know where to start with this recap, so hang on as I try to condense a lot of information and emotion. 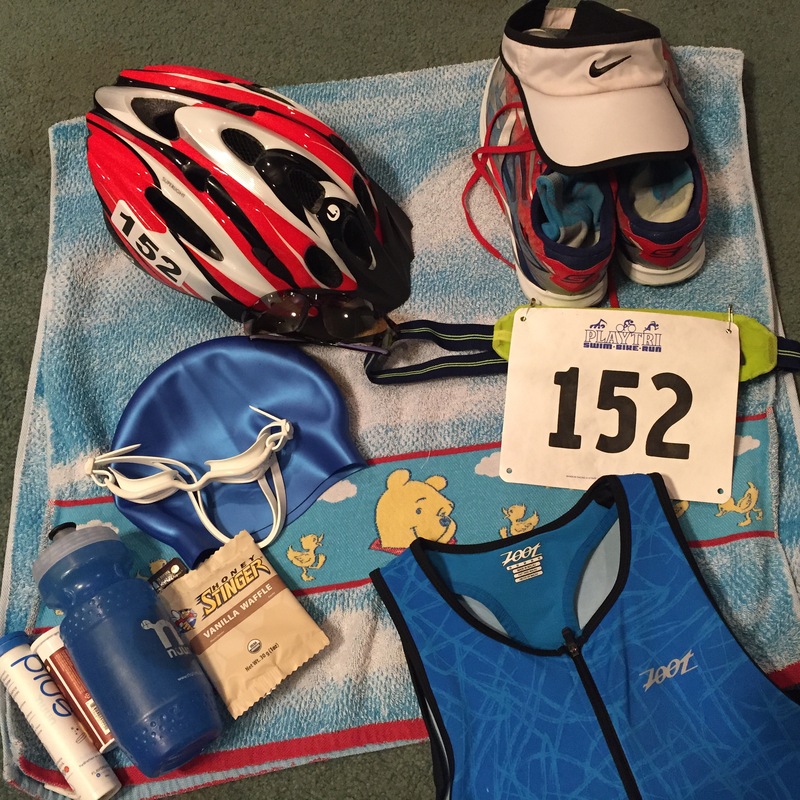 For my first triathlon I felt ready and totally unprepared all at once! Fortunately, I didn’t allow myself to visualize going through the whole race until the night before the day before (no that’s not a typo) – because then I kind of started to freak out. Then on Saturday, my youngest was sick and that pretty much took my mind off the race except for wondering if I was a sitting duck for the stomach bug. I had one major panic moment Saturday evening while getting my things together. Less than five minutes after airing up my back tire, it blew. It was then, at 8 pm, that we discovered I only had one spare tube. So while I attempted to change my tire, my husband patched the tube. In case of emergency. Now, I had already changed a flat in the front and the back with help from my husband a few weeks ago. 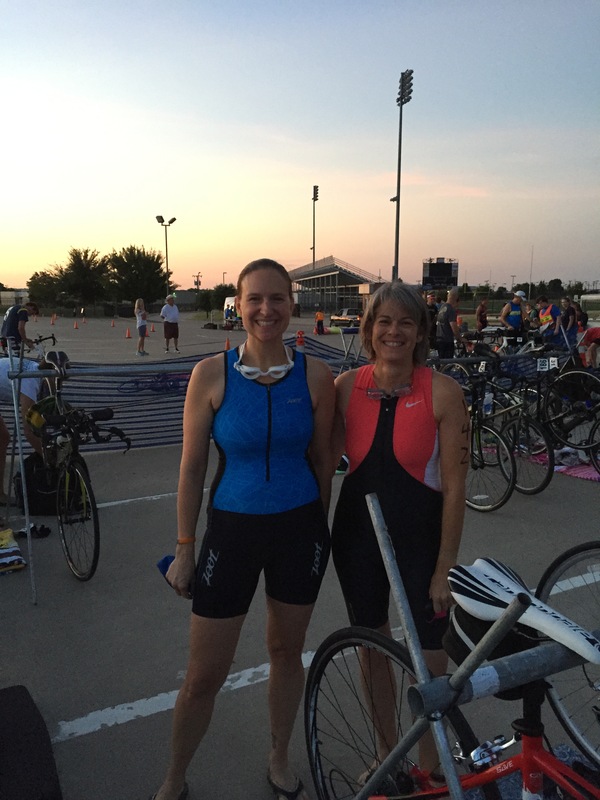 Also, earlier in the week, my Ironman friend went over transition with me and helped me practice changing tires. But I still didn’t feel confident – or fast. I was able to get it changed okay, but when trying to put it the wheel back on I almost dropped the chain completely off. It was not pretty. I was in tears asking my husband to fix it for me. Tough love. He made me figure it out. “What are you going to do on the side of the road when I’m not there?” Cry. That’s what I’d do. But I got it done, and I was ready to sleep. Someday I will thank him for that learning moment. We left early the next morning to make sure we were there before transition opened. I tend to get a little high strung when doing something new (first 5k, first half marathon, first marathon), so I needed to be there and have a little time to chill. I went into the Rockwall Aquatics Center to search for a restroom. Then I saw the pool. It was huge! I have been doing my swimming in a pool that is 25 meters long. This one was much longer, larger, and deeper. My nerves went into overdrive. Imagine how bad I’ll be for an open water swim. 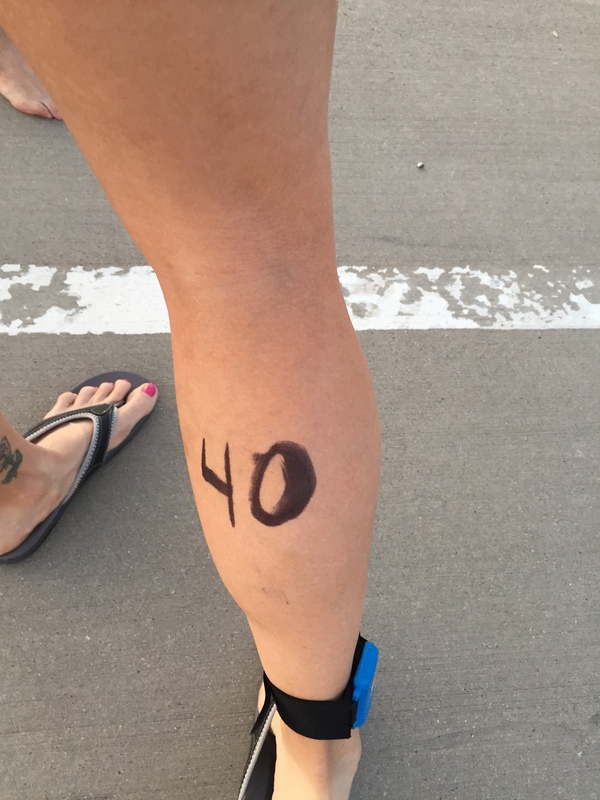 I headed outside to get my transition area set up, body marked, and pick up my chip. Also, I was thankful I talked my friend into doing this with me. It made me less nervous. New things are more fun with friends. We were asked to line up in numerical order by our race number. I remarked to someone that it was strange walking around looking at people’s calves. My number was 152, so I had some time to watch. I didn’t feel as nervous (since I had done a warmup earlier), but still the swim was the struggle I knew it would be. I couldn’t seem to coordinate anything. 300 meters, six lengths of the Olympic size pool and swimming under the rope in each lane. It threw me off jumping in, sinking down, and not having the wall to push off from every 25 meters. I felt like I was being passed in droves. 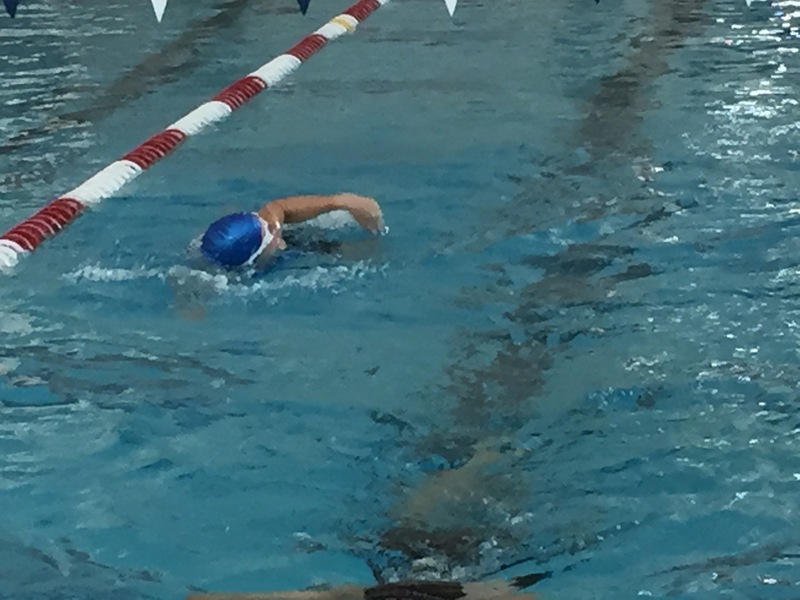 I have never been so happy to get out of the pool – and hey, I wasn’t last. Transition went fine and I know what I need to change to make it smoother and more efficient. My husband videoed my transition, so I can see where my time went. I was biking in my running shoes, because I didn’t want to try to learn to clip in yet. Once on the bike I was glad for a chance to catch my breath and let my legs do the work. The bike was almost 13 miles of an out and back course. There were some nice downhills, but some fairly decent uphills too. Off the bike in the second transition, I was much faster. All I had to do was rack my bike, take off my helmet, and put on my visor. I was outta’ there and so excited to run. Yay, it’s a 5k! The run was a two loop course around the parking lots of the complex. 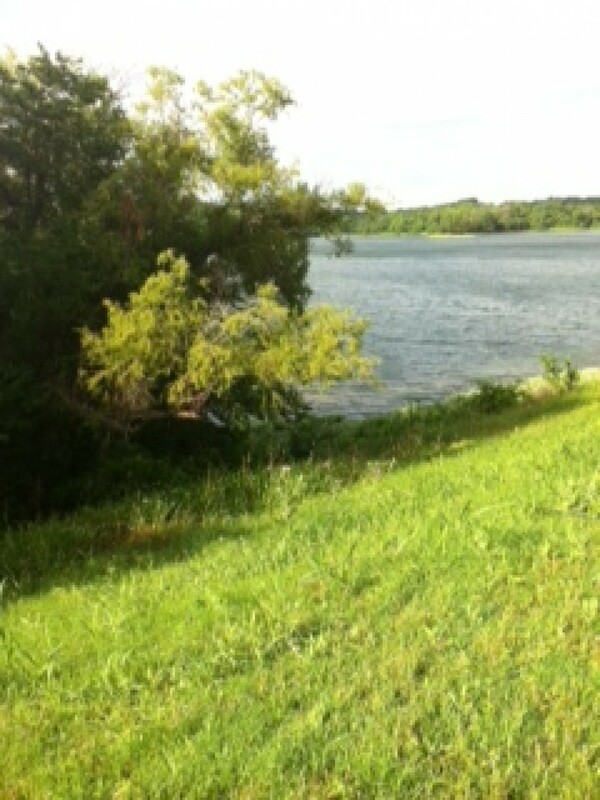 I anticipated the heavy feeling in my legs and ran solely based on effort. 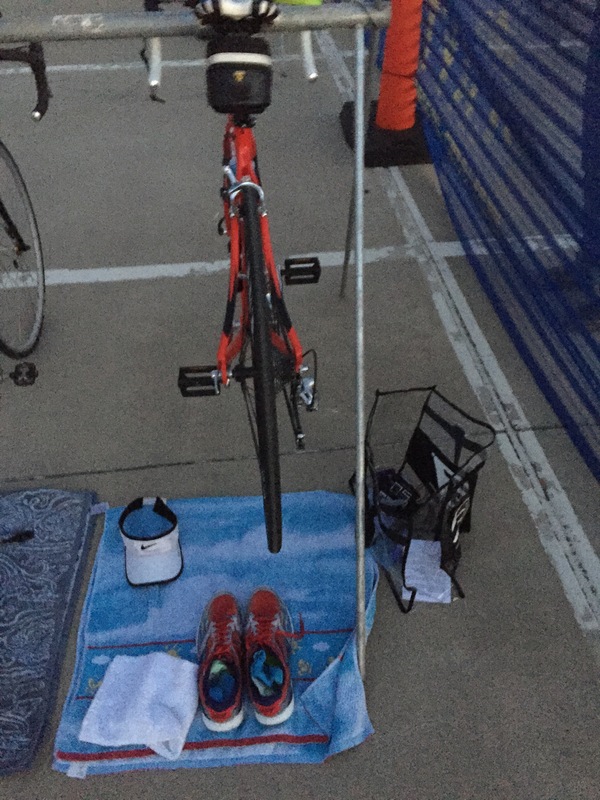 I was without my Garmin, since it would do me no good on the swim and bike portion. Also, I wanted this race to be about the experience. The goal for the first one is just to finish, right? I still can’t believe I tackled my fears this way. 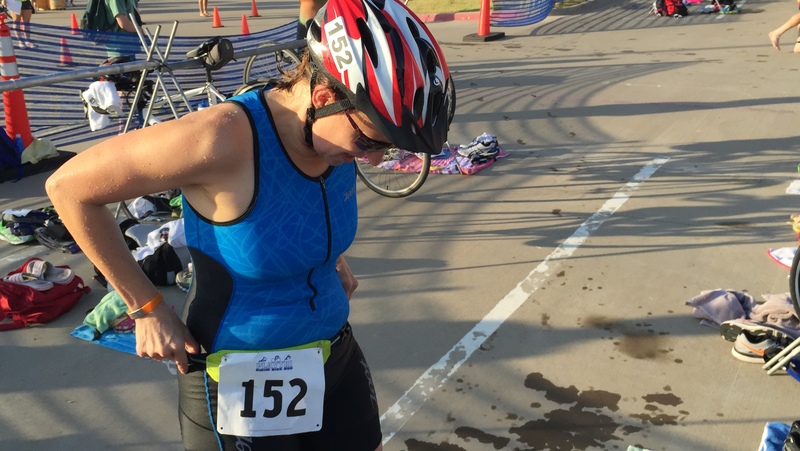 I have been kicking the idea of triathlon around for a while, but it overwhelmed me. How to balance three sports when I tend to fall apart during peak marathon training? 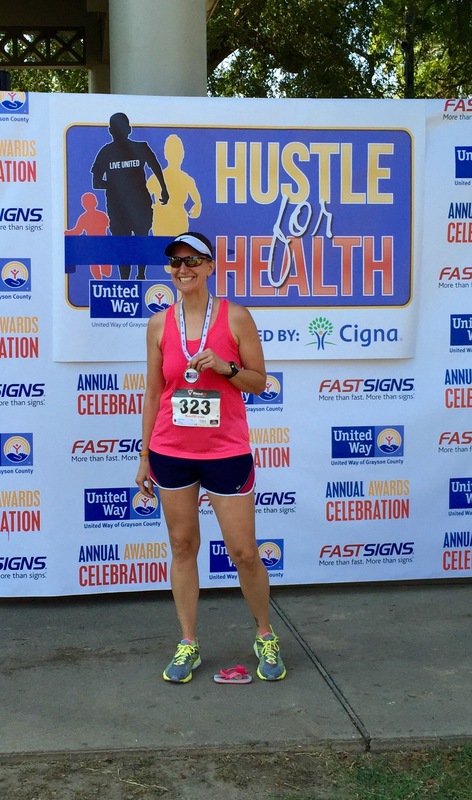 My plantar fasciitis injury helped me realize the need to change things up. My foot is not completely back to normal, and the swimming and biking have helped me become stronger and more fit. I feel like a better, balanced athlete and a stronger runner because of it. 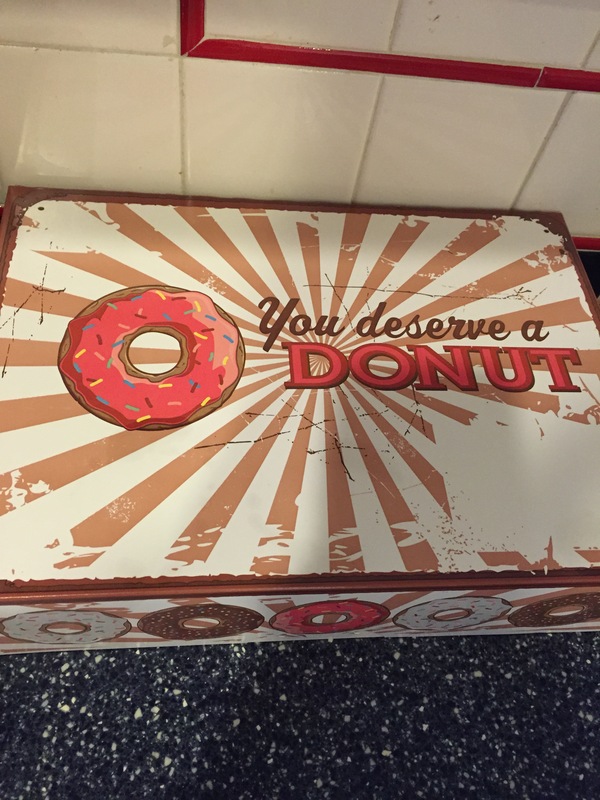 I believe this will serve me well going into marathon training. Oh, and I had fun with it too!